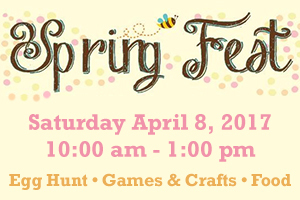 Join the festivities at the city’s Annual Spring Fest on April 8th at La Ladera Park from 10 a.m. to 1 p.m. Activities include games for the kids, crafts, petting zoo, inflatable jumpers and food vendors. The Egg Hunt kicks off at 10:30 for kids up to 9 years old, so don’t forget to bring your basket for treats. Children can also get their picture taken with the Easter Bunny and there will be a super fun Kids Zone!